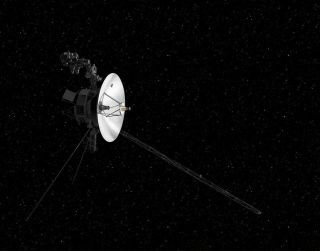 Going, going — nope, it's still just going, NASA says of its Voyager 2 probe, which the agency realized was approaching the edge of the solar system back in early October. In a statement released yesterday (Nov. 14), NASA shared additional data from the probe that gives engineers a sense of where the spacecraft currently is in relation to the solar system. The Voyager 2 probe, which launched in 1977, swung past the gas giants of our solar system, making this spacecraft the only device to gather detailed data about Uranus and Neptune. Then, its mission complete, Voyager 2 barrelled on, out toward the edge of our solar system. The new data comes from an instrument called the Low Energy Telescope, which tracks the low-energy particles characteristic of our solar system. Given the data Voyager 1sent home during its 2012 farewell, the team expects those encounters with low-energy particles to nearly disappear as the probe makes its exit, NASA said. A graph shows how many heliospheric particles are hitting the Voyager 2 spacecraft. When the probe leaves the solar system, that count will be near zero. And at the beginning of November, the team noticed a sharp decline in the number of particles encountered — but not all the way down to nearly zero, where it will remain after it leaves our neighborhood. That means that the spacecraft still has a ways to go before scientists can finally declare it free of its home solar system. The new data adds to the first warning of Voyager 2's impending departure, which came from the probe's High Energy Telescope, which measures high-energy particles. Those particles become more prevalent as a spacecraft leaves the solar system. The spike in energetic particles is a signature of the probe gradually losing the protection of a bubble around our sun called the heliopause. That bubble is formed by the solar wind, a constant stream of charged particles that is born in the sun, quickly accelerates in the star's atmosphere and then sets off across the entire solar system. Because the sun's strength ebbs and grows, the precise location of that heliopause bubble isn't constant, which makes determining when Voyager 2 finally makes its escape more challenging. But even as Voyager 2 is investigating the far edge of that solar wind stream, a much newer NASA spacecraft has begun investigating the place where that solar wind picks up so much speed. That's the sun's outer atmosphere, called the corona. The agency's Parker Solar Probe, which launched in August, made its first of 24 planned science passes around the sun earlier this month.